It is high time to prepare for filing your tax returns as the last date to file your ITR is coming closer. However, people in general, face a lot of issues while filing ITR online, which is understandable as it’s not that easy as it looks. However, these Tax Related Issues can be easily resolved if you consider caring for a few things related to tax e- filing. What we are focusing over here is, protecting you in advance from the pain concerned with ITR-filing process. Financial year 2016-17 has almost come to an end and the March 31 deadline for filing the tax returns is worrying a lot of the tax assesses at present. Besides, last-minute hurry to complete the tax-filing process can make you indulge in a lot of problems. And therefore, you must ensure buffer of at least 2-3 days with keeping a surety in mind that one or the other ITR-related issue might pop-up at any time. You must have the ample time with you at all times in order to correct any such ITR issues. 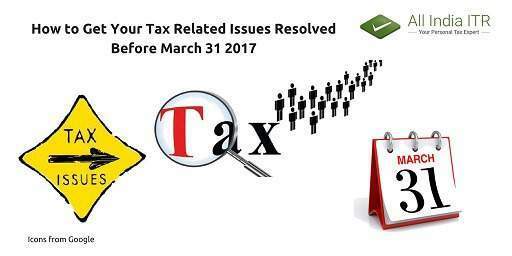 If you have still not filed the ITR for assessment year 2014-15, then March 31, 2017 is the last date for you to file for the long-pending ITR. Officially, in one financial year, a person is allowed to file his/her IT returns for the previous two financial years. And that also states the fact that in FY 2016-17, one can file returns for FY 2015-16 and FY 2016-17. While filing ITR for previous years, don’t forget to add interest on the taxes due, if any. According to Section 234A (IT Act), interest gets charged for delay in filing ITR. The assesse is entitled to pay simple interest @1% per month/part of month in case of delay in ITR filing. In order to avoid interest charged as penalty, one should pay all his taxes due by March 31. Let’s suppose that an employee has switched jobs in the assessment year 2016-17, then it becomes his duty to inform the present employer about the details related to previous employments like PF(provident fund) contributions, Section 80C, LTA(leave travel allowance), etc. The said procedure must be completed by an individual at the time of joining a new job, and by March 31 positively. Further, Form 12B must be used by such a person for communicating details like “salary earned” and “TDS deduction” at the previous employment. Apart from this, one might like to disclose his/her tax deductions which he would like to claim via using form 12BB by submitting the same to his present employer. There are various tax savers that can immensely help you with lowering your tax liabilities, like NPS (National Pension Scheme), PPF, etc. But, in order to keep these tax savers active, a minimum amount must be deposited each year. Otherwise, you will need to pay the due amount along with penalty for making the tax savers active again. The date, which is March 31 must be kept in mind each year to deposit the minimum amount in them. It’s also important to mention over here that in long terms, it doesn’t help much in depositing the minimum amount. So, it would be advisable to invest in these tax savers very carefully. Regarding PPF, it must be noted that it requires you to pay Rs. 500 a year to keep it up and running, whereas NPS (Tier I) on the other hand demands you for Rs.1000 a year, excluding taxes. But, in NPS-Tier II, there is no requirement for the submission of any yearly deposit. Tier I also require you to do at least 1 submission per year. In case of salaried individuals, it is not enough to merely making a tax saving investment. Such an individual need to mention the evidence of the same by submitting the related documents to the employer. Every employer has a cut-off date for such document-submission related tasks, which might fall in between the timespan from January till February. If the employee somehow fails to submit the said documents within the cut-off date declared by the employer, he can still mention it while filing tax returns in order to avoid any ITR related issues in the near future. It would be highly recommended that you should not indulge in making investments on ad-hoc basis as it might not prove to be a fruitful decision. On the contrary, you should make plans in advance related to your tax saving requirements which will surely pay you off while filing ITR for FY 2017-18. Otherwise, the conditions and circumstances are not going to be any different from what it is this financial year. Further, by planning in advance for the next year, you will also be able to avoid the hassle related to many of the ITR Tax related issues. Thanks , this really help me alot.This blog is really helpful for us to know more about ITR.This is the blog that i needed and i have been searching for such blog from a very long time now .